I’m considering installing a Perforated Metal Gutter Guard on my home gutters. I have a wood shake roof and trees with leaves but no pine needles. Q. Do I need to be concerned about debri[s] getting through the holes? A. Absolutely. The measure of a gutter guard’s effectiveness will be the warranty provided by the manufacturer. Some products offer warranties on the material only and nothing on performance, while others offer it on performance and material. I would select a gutter guard from a manufacturer that includes a performance warranty. That pretty much rules out products from Home Depot and Lowe’s, and will require you to seek products from building supply distributors such as ABC, Lansing, Norandex, etc. If a product has a performance warranty, then that means the product has either been tested to show that it won’t clog or the manufacturer is so confindent in their product that its failure rate will be extremely low. 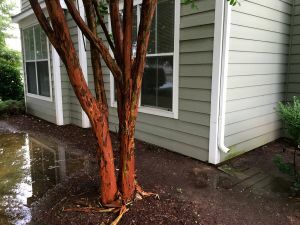 Performance warranties are either going to mean that the gutters will be professionally cleaned at the manufacturer’s expense if they clog or they will offer a money-back guarantee. Q. Will organic matter get through the perforated holes and turn into muck and and evenatully clog my drain several years from now? 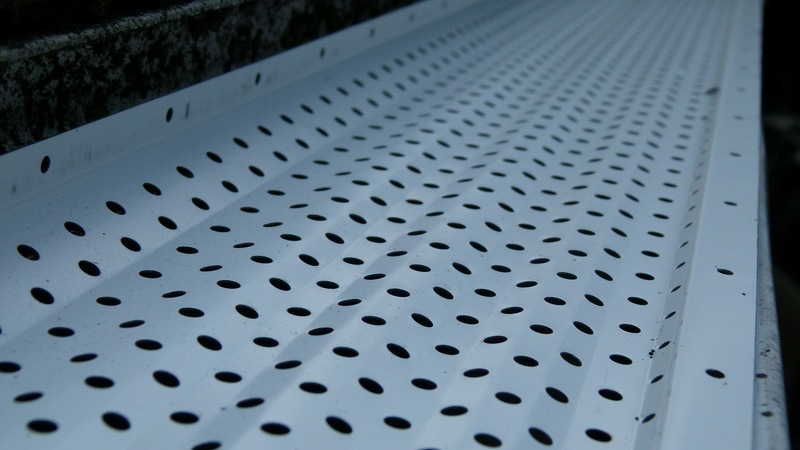 Manufacturers of perforated metal gutter guards and gutter screens believe that the amount of debris that enters the gutter will not cause the gutters to clog. Most clogs are caused by leaves and debris blocking the mouth of the downspout, so while these products will allow some debris to enter, the right product will probably keep enough debris out that it won’t clog. There are plenty of screens that will clog, so this is by no means a blanket statement to say that none of these products will clog. If this is a concern, make sure to select a product with a performance guarantee. Q. If muck does develop inside the gutter, do I need to remove? What is the best way to remove the muck inside gutter guards that have been screwed on? A. It really depends on the severity of the problem. First off, make sure that your gutters have been thoroughly cleaned and hosed out before installing a gutter protection system. 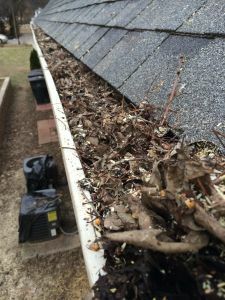 All too often, we see gutters that were not properly cleaned, and the organic matter that was left behind caused a problem down the road. If your gutters clog after installing the new perforated metal gutter guard, then you know the guards aren’t working, and you’ll need to invest in a better brand. If you are okay with occasionally cleaning your gutters by installing a screen that will allow debris penetration, then I would recommend using a hose with a high-pressure nozzle and spraying out the gutters. Start at the high end of the gutter — away from the downspout — and push the debris towards the downspout. Most debris will wash through down the downspout, but if anything gets lodged at the downspout mouth, remove the section(s) near the downspout and clean that area by hand. Then stick the hose into the downspout and push any remaining debris through the downspout. If the downspout goes into an underground drainage system, you’ll want to intercept the debris before it goes underground either by catching it while it’s still in the gutter or by removing a section of the downspout at ground level. Q. Can wood shakes be damaged by inserting the perforated metal gutter guard under the shake? It depends on the age and condition of the shingles, how tightly they fit against the roof sheathing, and where they are nailed in relation to the roof edge. The best way to find out is to try to insert the gutter guards in a couple of places to see how they fit. I would pick a spot that has the biggest drop from the roof line to the edge of the gutter. Generally, this is the area closest to the downspout. While asphalt shingles are pliable, any sigificant upward pressure on shakes could cause them to break or wear prematurely. Alternatively, there are perforated metal gutter guard brands that are installed within the gutter only and do not slide under the shingles. Two popular brands are Gutter RX by GP Industries and Leaf Relief by Alcoa Aluminum. Both Gutter RX and Leaf Relief are designed to sit within the gutter opening, which means that they don’t slide under the shingles; however, Gutter RX can also be installed at an angle in many applications, so this offers a distinct advantage over Leaf Relief, which has to be installed flat in the gutter in order to work. 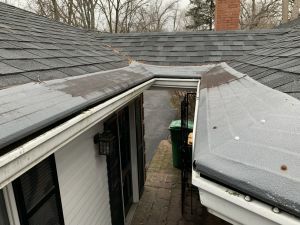 One caveat to this is that if roof shingles — primarily asphalt shingles — curl into the gutter, it will be difficult to install Gutter RX at an angle due to the downward pressure from the shingles. I’m a fan of Gutter RX perforated metal gutter guard. It’s affordable — we sell it — and it is easy to install. It includes a 20-year no clog warranty in which the manufacturer will pay to have your gutters cleaned if they clog. Leaf Relief comes in 10-foot lengths, so it can be difficult to work with. It has a 10-year money back warranty that is prorated in years 6-10. Gutter guard is absolutely essential as is evident from the experiences narrated here. Especially in countries like Australia, where dried fallen leaves pose a huge problem clogging the gutters, it is absolutely imperative to use gutter guards lest you face subsequent hazards during rainy seasons.